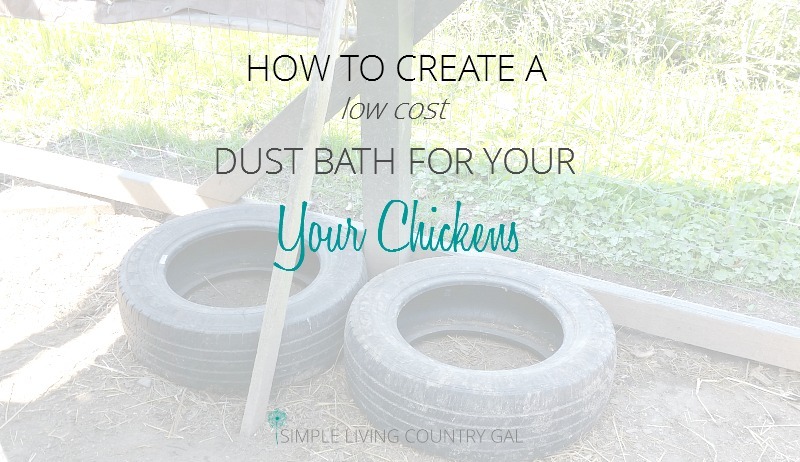 This article will walk you through how to make dust baths for your chickens. When I first starting raising chickens I knew nothing. Every day was a learning experience. I remember one day going out to check on my girls and I found one throwing dirt up all around her. I had no idea what she was doing but stood watching her for some time marveling. I found out later, she was just taking a bath. Yep, a bath with dirt. Ah, my dear sweet peeps…gotta love ‘em! I did some research and learned that the addition of a dust bath to my chicken run was necessary to not only promote the health of my flock but to create a calm environment as well. It is really important to have a zen-like (is that a word?) atmosphere for your hens to deter henpecking. Read my post, Thinning out the Flock to learn more on this and how to deal with it. If you are new to chickens this may sound like a crazy idea. Do chickens like to bathe? And in the dust? Seriously? Why yes, I am being serious. Actually, chickens really do love dust baths and find the act very comforting so much so that when they finish they literally pass out sometimes even on their sides or backs. I cannot even tell you how frightening it was for me the first time I saw a hen on her back sleeping! 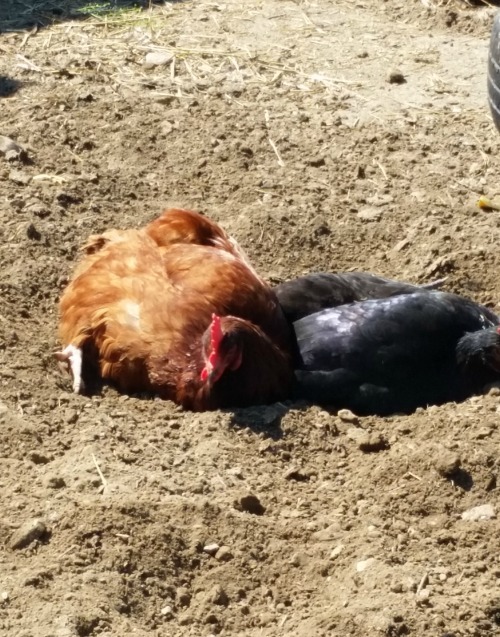 My hens sleep so soundly that many times even now I need to walk up to a dust bath napper (geeze, say that 3 times fast) to check and make sure she is actually just sleeping and not, ahem, dead! When you first see a chicken dust-bathing the ritual can be quite comical. First, the hen will dig a shallow hole. They will lie down in it kicking and tossing herself around throwing dust and loose dirt into her feathers. This can last for quite a while until they eventually shake all the dirt out (a show in itself) and settle down and take a long nap right there in the hole. Dust bathing is an ingrained act; even baby chicks will attempt to dust-bathe in their brooders. I have never added a dust bath for my babies, but I know others have with good success. 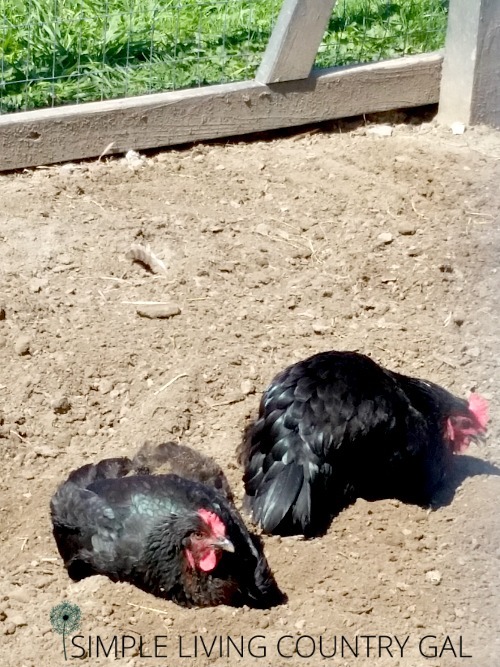 Dust Baths for your Chickens – Now for the techy stuff…. Why are dust baths so beneficial? Chickens have glands that secrete oils. Over time excess oils can build up along with dead skin creating the perfect home for parasites. When a hen tosses loose dirt through her feathers she dries up the excess oils and removes dead skin along with any parasites. This leaves her feeling clean and refreshed. If your outdoor area (chicken run) is small, you may want to create a specific spot for your gals to bath in. This can be easily done (and quite inexpensively) with a dishpan, litterbox or even old tires like I did. Check around the house for anything large enough to hold a hen but shallow enough for her to get into without tipping it over. Ninja tip: If you are building and outside bath, make sure you have something to cover your dust bath at night and during rainy times I have found if the materials inside get wet it can take forever for things to dry out. I just use a trash can lid to cover my tires. 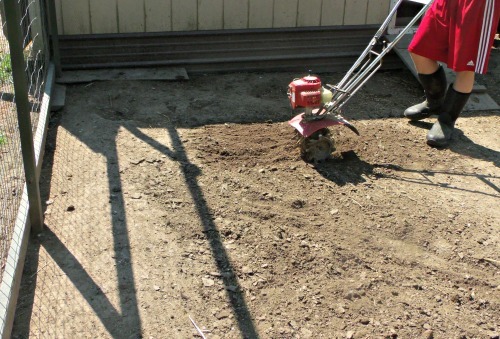 I also like the low-cost method of simply rototilling up an area in the run to loosen the dirt. My girls will jump in right away and start kicking up dirt all over, it’s quite funny to see. 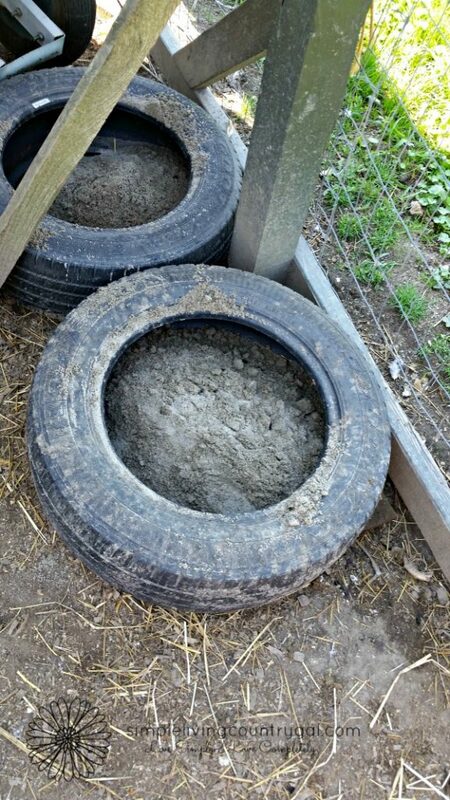 Once you find a container you can add a mixture of construction sand, loose dirt, Diatomaceous Earth and wood ash if you have any. If you use DE make sure it is food grade. Some folks warn against DE in dust baths believing it may do damage to the bird’s lungs if used in large amounts. I have not had a problem with this, but I want you to know the warnings just the same. If you choose not to use DE don’t worry, the dust/sand/ash will do the job just fine. Place your bath in an area that is easily accessible for your hens. If you have a large flock, more than one is a good idea. It may take a while for the hens to realize exactly what you have made for them, but don’t worry before you know it they will be bathing to their heart’s content! Being proactive in your animal’s health and wellbeing is more cost effective than waiting until you have a problem. Not only will a dust bath provide health and happiness to your flock but it will give you hours of entertainment as well! Get your FREE Mini Home Planner Pack! This mini planner is just what you need to get a little bit of control over your schedule. You got this friend! You say “Add about 1 cup DE and a few cups of wood ash” What is DE? DE is Diatomaceous Earth which is made from the fossilized remains of tiny, aquatic organisms called diatoms. It helps control parasites on chickens when they dust it into their feathers. Make sure to always use food-grade that can be found at any feed meal or Amazon.com as well. Thank you for all the great info. I am new to raising chickens, and I am so thankful for folks like you willing to share your knowledge. My question is, when you add wood ash to your baths, would it be harmful to use the ashes from our fireplace if we have used fire starters? We don’t use the starter logs, just the smaller blocks. I wish that question was easy to answer but it all depends. When using wood ash for your chickens a good rule of thumb is only to use ash from hardwoods. With that being said it really depends on the ingredients of your starter blocks. As long as the ingredients are all hardwood you will be just fine. I hope this helps. And good luck with your new chickens!